Carolyn Strom Collins and Christy Woster compiled and edited a new collection of L.M. Montgomery short stories called After Many Years. It was published by the L.M. Montgomery Institute and all sales of these first edition books will be donated to the LMMI. Nimbus Publishing will print a second edition in May 2017. Many kindred spirits contributed to an online fundraiser organized by Vanessa Brown, of Brown and Dickson Bookstore, in July 2015 to acquire items in an auction that were part of L.M. Montgomery stories. Many items from the auction went to members of the Montgomery family on Prince Edward Island, like the rosebud tea set found in Anne of Green Gables. However, the china fruit basket from The Story Girl was purchased with donations and given to the L.M. Montgomery Institute. Other items like inkwells belonging to LMM's grandfather, the Senator, assorted pictures of LMM and family members, and laminated articles about LMM and the Montgomery house were acquired. Not all of the donations were used in the auction and the remainder of those funds were donated to the L.M. Montgomery Institute for future acquisitions in June 2016. A very special handwritten letter from L. M. Montgomery to British composer Clara A. Macirone came onto the market and the board members of the "Friends of the L. M. Montgomery Institute" voted to purchase the letter for the Institute's collection. 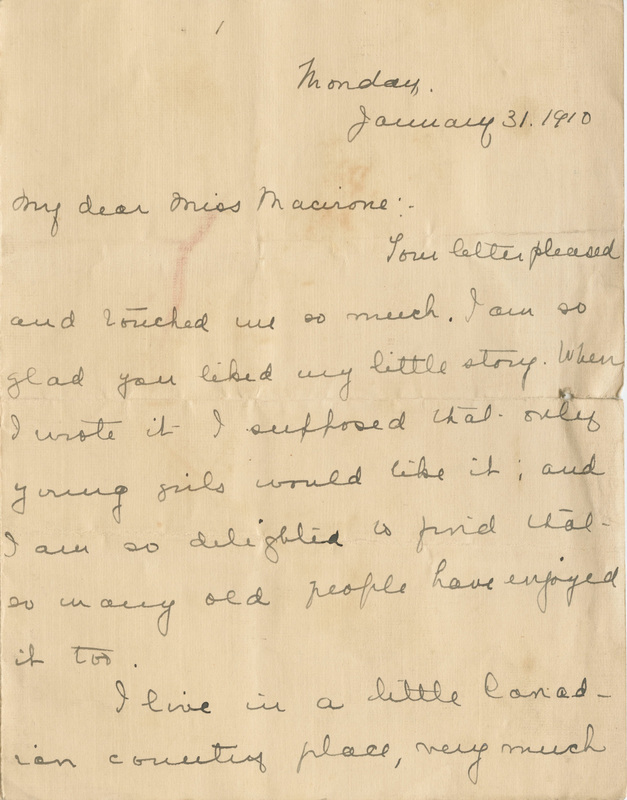 The letter was written from Cavendish in 1910, soon after the publication of Anne of Green Gables, and is much more personal and expansive than Montgomery's usual response to "fan letters." The funds for this acquisition come from many small donors around the world who are readers of L.M. Montgomery [scroll down to "Supporting the LMMI" for donation information]. In 1910, Montgomery was living with her 86 year old grandmother, Lucy, in Cavendish, Prince Edward Island. She was newly famous and well-paid -- "I live in a little Canadian country place, very much like the 'Avonlea' of my book. Life here is very quiet and simple, but I like it and find all in it that I could find anywhere I think," she wrote. LMM mentioned that her grandmother came from England "and I always feel a 'homey' interest in your wonderful old land which I hope some day to visit." She did make one visit on her honeymoon in 1911. Macirone asked if she might dedicate one of her songs to Montgomery and LMM responded that she would be "most pleased and honored." Macirone was born in 1821 and died in 1914. "Clara Angela Macirone is one woman who participated publicly in Victorian music culture throughout the period. A music teacher and composer of considerable fame, Macirone also contributed essays and reviews on music to the periodical press throughout her life. Born in 1821, she was educated at the Royal Academy in singing, pianoforte, and composition, and went on to become a professor of pianoforte there. Her songs gained popularity and recognition after being performed at the Crystal Palace and Exeter Hall, and her composition “Sir Knight” was the first music heard by Queen Victoria over the telephone in 1878." Macirone image and sheet music HERE. The L.M. Montgomery Institute [LMMI] is dedicated to helping students and scholars learn about and study L.M. Montgomery's life, works, and influence. The Institute is a centre for Montgomery studies with a focus on academic scholarship and a centre for the promotion of L.M. Montgomery with a focus on education, teaching, and increasing awareness of the author. The L.M. Montgomery Institute is housed in the Robertson Library at the University of Prince Edward Island (UPEI), a post-secondary institution whose forebears were St. Dunstan's University and Prince of Wales College (Montgomery's own alma mater). L.M. Montgomery's appeal crosses the boundaries of time, age, culture, and gender. Her works are translated into more than a dozen languages; she inspires serious scholarly work and maintains international best-selling status with her shrewd portraits, her minute chronicling of Island and Canadian customs, and her compelling recreations of Island land and seascapes. The L.M. Montgomery Institute pays tribute to Montgomery's achievement and provides a centre for the dynamic research that is focused on her works, career, and Island home. Montgomery's influence is felt today in almost every area of life on Prince Edward Island -- in education, research, the arts and theatre communities, tourism, land and building preservation, crafts councils, private businesses, and government policies and decisions. Internationally today Montgomery's works are recognized as touchstones for Canadian culture. Hundreds of thousands of people, directly or indirectly influenced by the way of life depicted in Montgomery's writing, visit Prince Edward Island each year. The LMMI was established in 1993 through the leadership of founder Dr. Elizabeth Rollins Epperly. Dr. Epperly is Professor Emerita of English and past President of the University of Prince Edward Island. To further their mission of helping to preserve the vast Montgomery collection now housed in the Special Collections of the University of Prince Edward Island Library, the Friends of the L. M. Montgomery Institute is raising funds through donations and as well as auctions at LMMI conferences (see The Shining Scroll, 2012, 2104, 2016). Among the many materials that the L. M. Montgomery Institute is responsible for are first editions of Montgomery's books original copies of Montgomery's stories and poems published in her lifetime, and artifacts associated with L. M. Montgomery herself as well as her Montgomery, Macneill, Campbell, Webb, and Woolner families. Most of these materials have been donated to the Institute by family members and Montgomery enthusiasts for safekeeping, maintaining, conserving, and use by scholars and others interested in studying the life and work of L. M. Montgomery. Carrying out these responsibilities can be expensive, as you can imagine. That is why the Friends of the L. M. Montgomery Institute was formed in 2012 -- to raise funds to ensure that the Institute can continue to keep the collection in good condition and to continue make it available for all of us to study and appreciate. You can be assured that 100% of your donation will go directly to the Friends fund. If you are donating in Canadian funds or most foreign currencies, you will receive a tax receipt; with some exceptions, U. S. donors will not receive a tax receipt if donating electronically (however, if U. S. donors wish to send a cheque [see below], a tax receipt can be issued). Yes, it is a little complicated for U. S. donors! But worth the effort! The link for donating on-line is https://secure.upei.ca/donate/ ; be sure to use the "drop-down" box entitled "Designate your Gift" and fill in "Friends of LMMI" in the space designated. UPEI US Foundation, ATTN: Kim Roach, UPEI Steel Building, 550 University Avenue, Charlottetown, PE, Canada C1A 4P3 (postage from the U. S. to Canada is $1.15 in 2014). We list our donors on the LMMI website -- if you prefer to be an anonymous donor, please indicate this for us on the on-line form or with your cheque. You may also wish to donate "In Honour Of" or "In Memory Of" someone.